Most of us will never visit Wowow TV Studios in Tokyo in real life. But together with MR BIG we can transfer ourselves to this living room like place. A string quartet, some invited Japanes fans, and some down-to-earth versions from the bands repertoire are on offer. There are of cause no speedier numbers but even PAUL GILBERT cranks up the power in the closing number ”Nobody Left to Blame”. They conjure up a blend with many new songs like the smash hit ”Undertow” and the here most caressing take on the heartfelt ballad ”All the Way” plus a whopping five more numbers of their latest release. But they will of cause not leave the stage without performing ”To Be With You”, or ”Voodoo Kiss” or ”Take Cover”, complete with jungle drums, to the apparent delight of an excited audience. 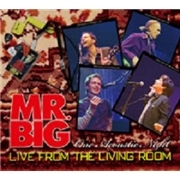 MR BIG doesn´t go wrong, the bass work is as fantastic as can be expected, the guitar as well. The trip to nostalgia is there, but honor to the band for serving up so many of the great new songs. Eric Martin seems to enjoy himself and Pat Torpey is Pat Torpey, even if I´ve never liked acoustic drum solutions. This is an impeccable performance but I still prefer them with the usual arrangements and an electric setting.